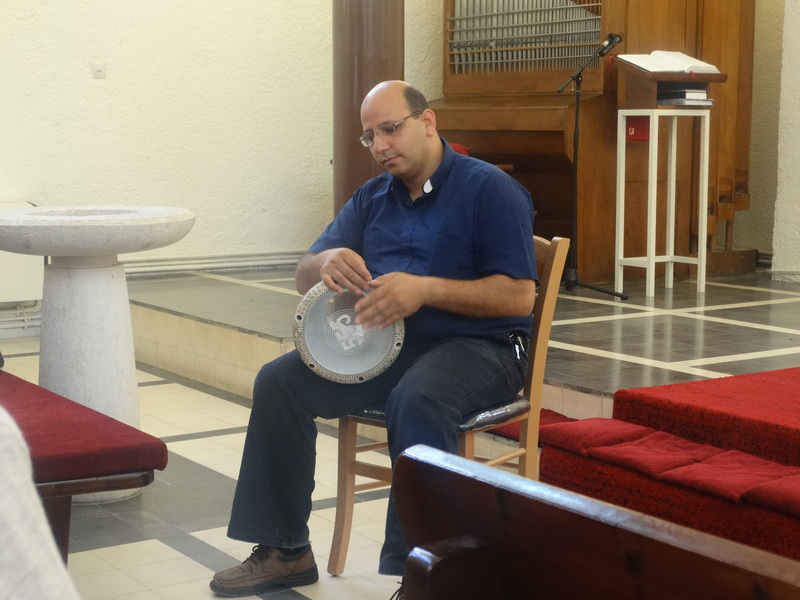 (While you read, I invite you to listen to this musical prayer for peace which combines Arabic and Hebrew. All of the 2015 Peace Not Walls/Young Adult Tripshave returned from their trips. Two related ideas come to mind for me. 1. Those of us who went on a trip tell you about what we saw and heard on our trips. 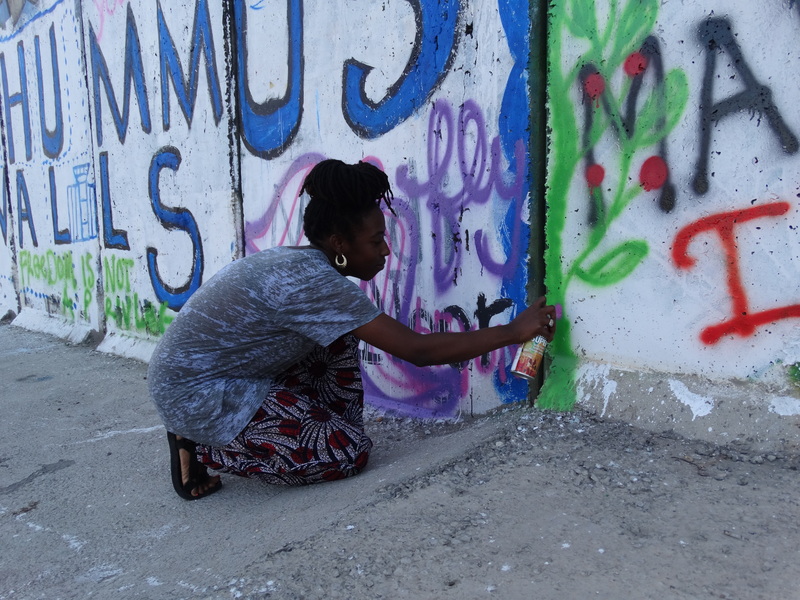 We also CONNECT what we learned on our trips to historically oppressed communities and liberation and justice movements in the United States. Three that come to mind immediately for me and for many of us (connections the Chicago trip already discussed on its trip, at least) are #blacklivesmatter, immigration reform and pursuit of economic and social justice for the American Indian community. 2. ACT. 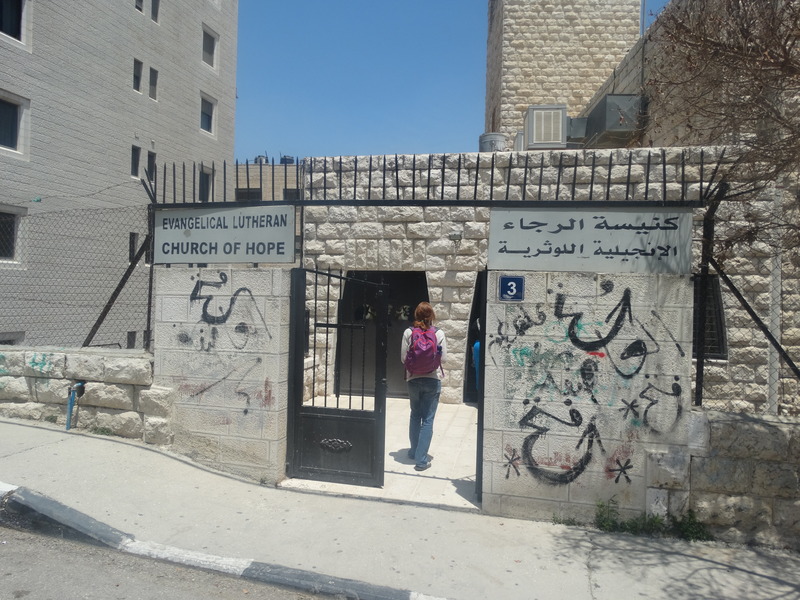 Continue to educate ourselves about current events regarding the Israeli occupation of Palestinian land in the West Bank, such as housing demolitions and solider-citizen interactions. 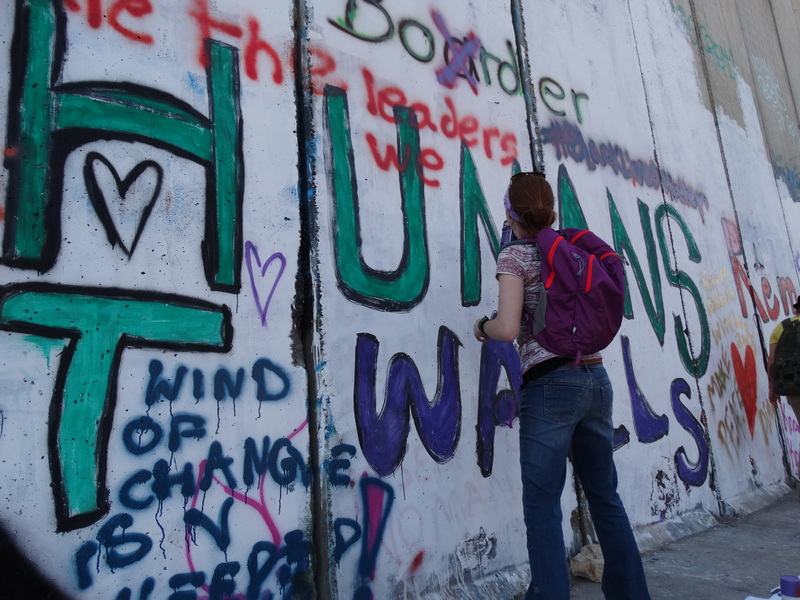 Contact our government representatives and religious leaders by phone, letters, email, or social media to voice our opinions and concerns about how their votes and actions affect events in Israel and Palestine. And pray amidst these actions that peace with justice would come to all in the land so many call holy. So. Let’s try those two out. 1. How do we CONNECT? 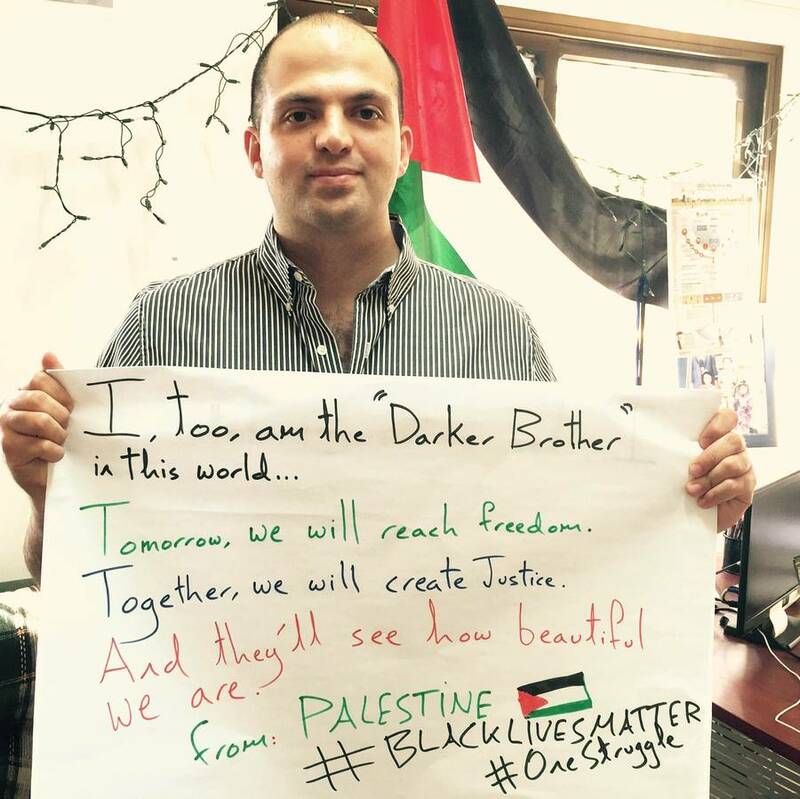 The following image of Fadi in Palestine and his message is from the following mic.com article by Zak Cheney-Rice, which opens “The connections between black people protesting state violence in the United States and Palestinians fighting occupation in Gaza and the West Bank have been well-documented.” The article goes on to feature screenshots of tweets from Palestinians advising Ferguson residents on how to deal with tear gas. 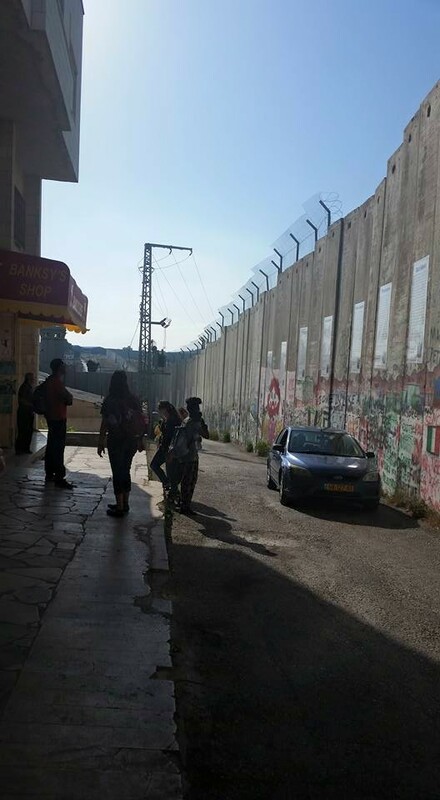 The wall in Palestine is also a wall between two groups as defined by the categories above. All of these walls must crumble for the kingdom of God to be realized, for us to truly know each other. 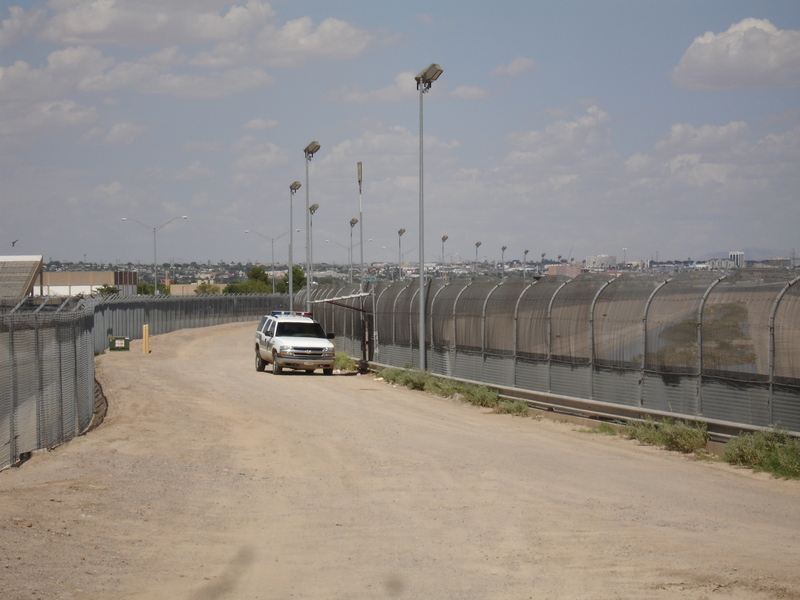 The stigma that surrounds immigrants in the United States is scarily similar to the stigma that surrounds Palestinians in Israel and Palestine. Mass business raids and deportations in the United States come to mind. Both groups are often racially profiled and treated differently, often more harshly and scrutinously, by government authorities than others would be because of their physical appearance. -One book we read before our trip was Blood Brothers by Elias Chacour. This book, along with our visits to refugee camps in the West Bank, makes me think of the connection between American Indian communities in the United States and Palestine. 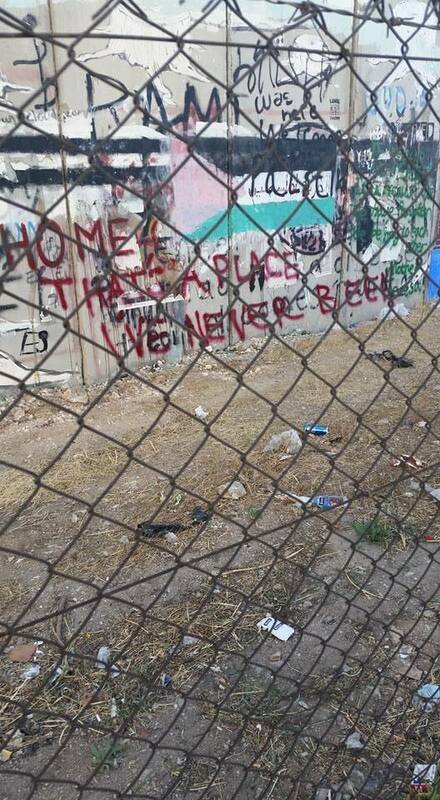 As American Indians had communities decimated by Europeans 250-300 years ago and are on reservation lands today, so are many Palestinians confined to refugee camps, the land that they first lived on taken from them by Israeli forces. and their children grow up today in these camps. We owe it to ourselves, to our children, to all who died because of persecution, to tell the truth about the past and to work for peace with justice and an equitable future for all. 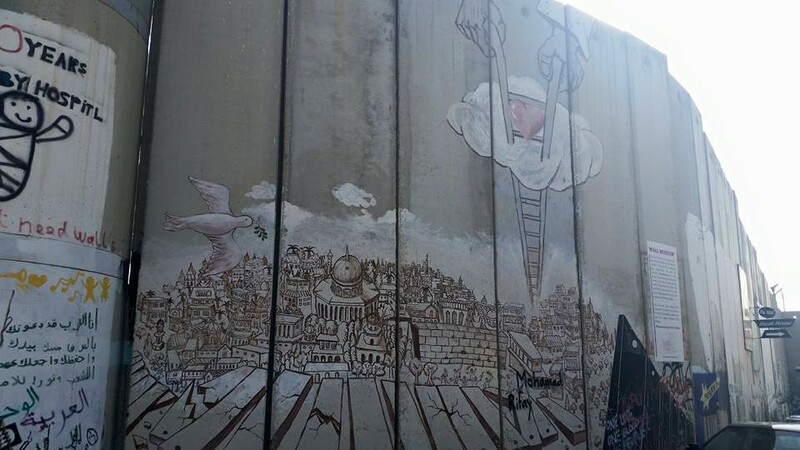 What other connections do you see between occupied Palestine and the United States, or other parts of the world? Let me know in the comments! PS. While it felt like a good release (at least for me) to paint on the wall, we later learned that the gentleman was selling prints of the art on the wall for double the price at the Banksy Shop just up the street. This made me sad and angry. 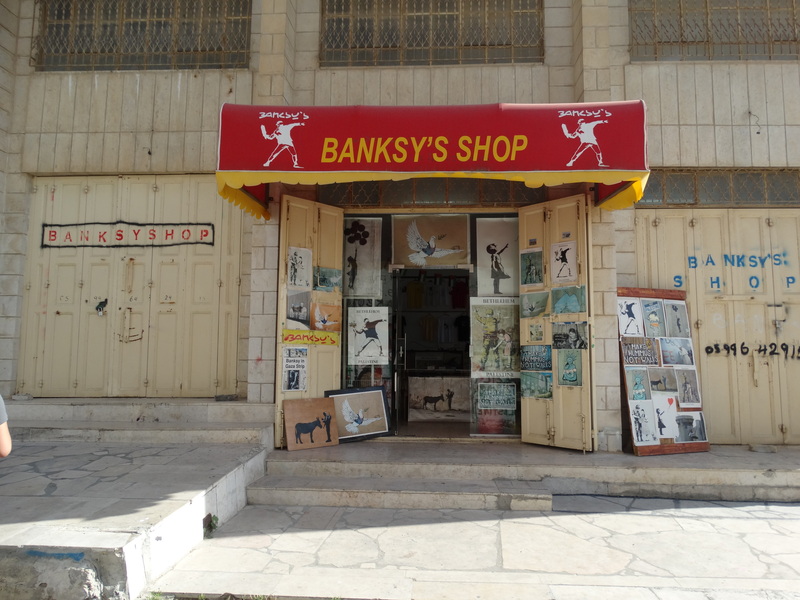 Moral of the story – support the Banksy shop. The owner has a great collection, is very nice, and charges very reasonable prices. 2. What are some ways we can ACT? 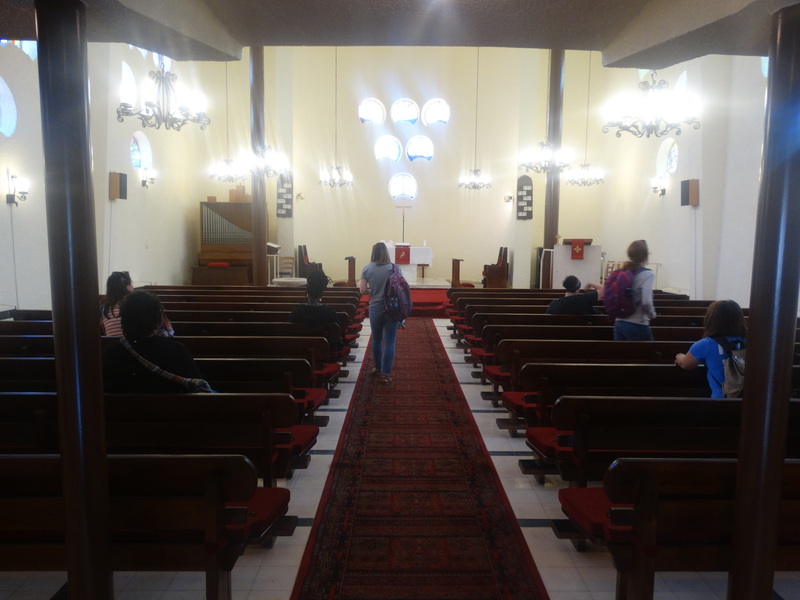 The link contained in the Thunderclap text will take you to a list of worship resources to pray for peace in the Holy Land in the form of liturgy, prayers and hymns. The Thunderclap, and the other online actions I’ll go on to describe, may seem like a small step. But one small step at a time is a step farther ahead then we were before we took the step. Online activism does raise visibility of causes and raises hope for those whom the cause benefits. 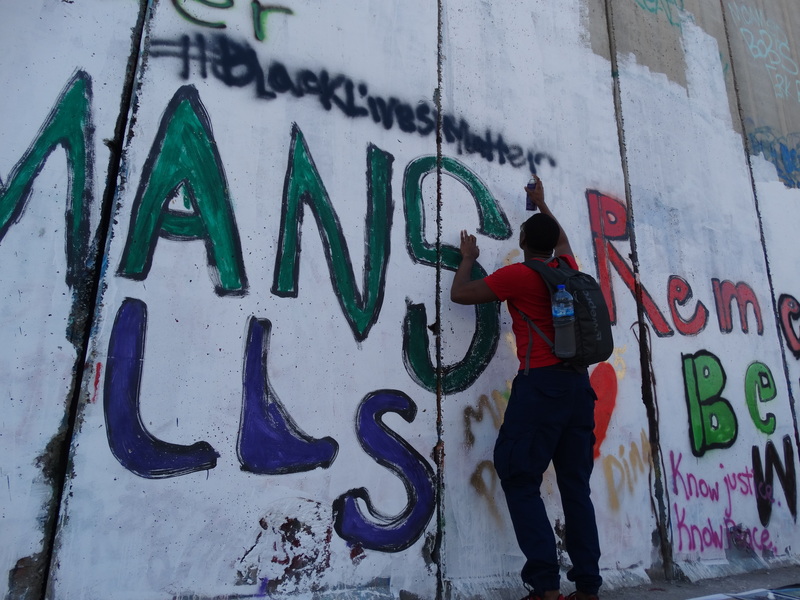 We can continue to inform our representatives in Congress about our views on the situation in Israel and Palestine, and ask them if they are going to the region and who is sponsoring their trip. 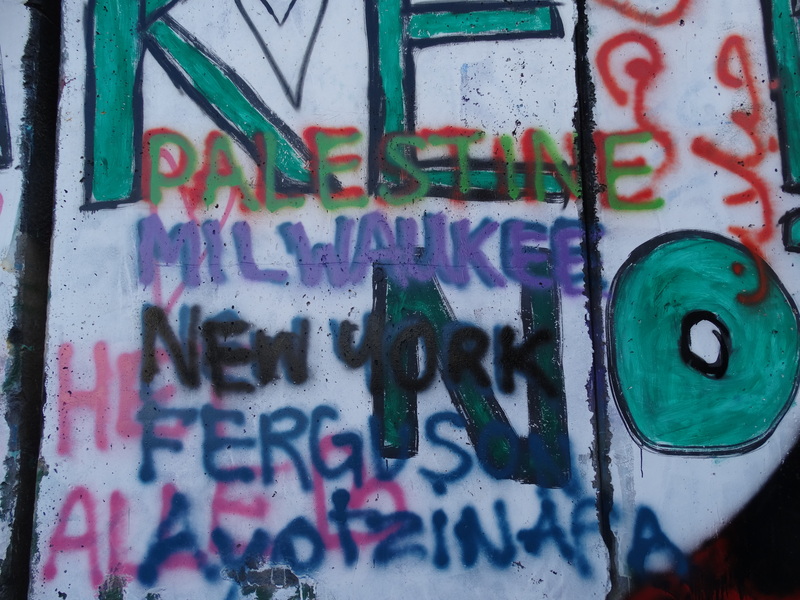 Illinois was the first state in the US to pass legislation regarding the BDS movement. In May 2015, a unanimous vote by the House and Senate and a signature by Governor Rauner made it illegal for IL’s pension fund to invest in companies that boycott Israel. This is a scary situation because it suggests a reinforcement of Israel’s actions. There are many companies that one can boycott or ask to make a statement on its activity in Israel. Sabra and Tribe Hummus and SodaStream are two big ones that come to mind, but there are others. I’ll let y’all do your own research on that. e. Educate! 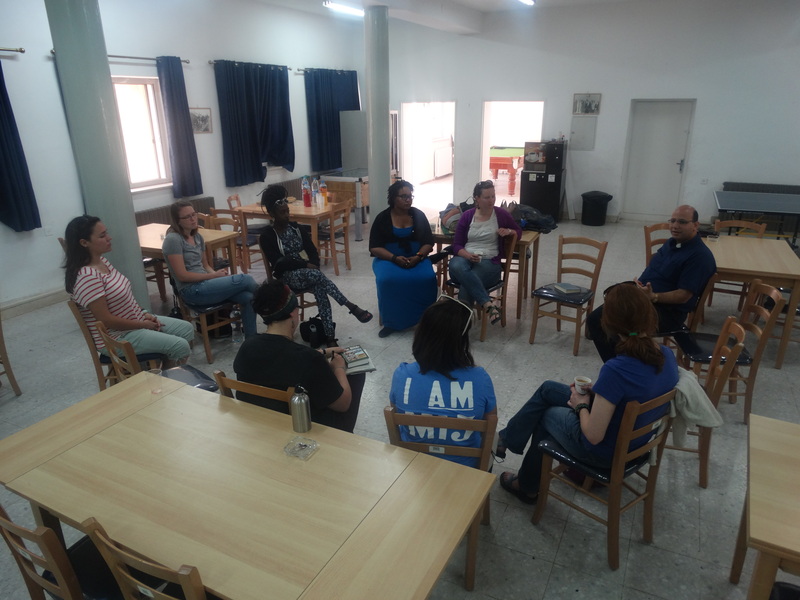 We can share stories about our trip with our family members, friends, and communities (schools, churches, workplaces, etc). The more we talk about positive stories out of Israel and Palestine, the less negative imagery about the region will dominate everyone’s head space. I feel like I could write forever on this. 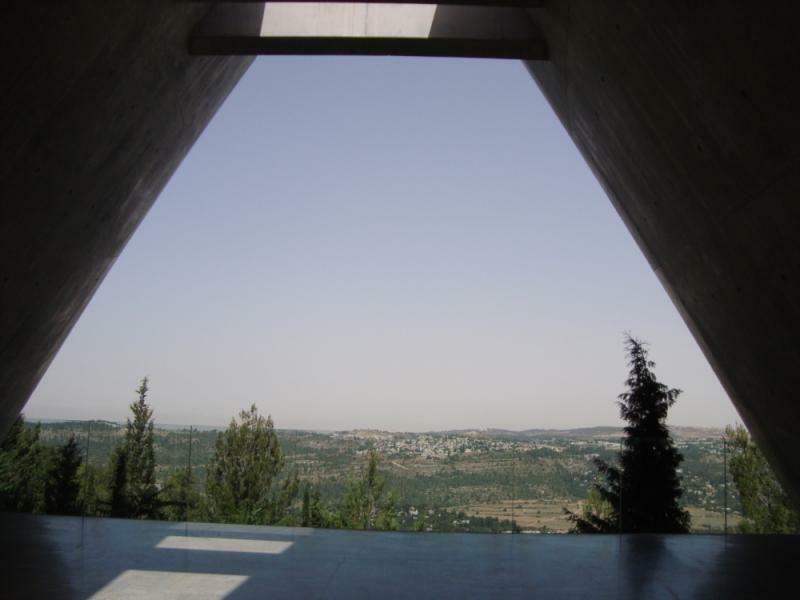 But for now, I’ll end with a reflection on our visit to Yad Vashem “The Holocaust Martyrs’ and Heroes’ Remembrance Authority” museum and monument, which makes me think about both connecting and acting. I was reading the exhibits about the period in the early 1940s when European Jews were beginning to be moved into “ghettos”, smaller neighborhoods in the European cities where they lived. And it wasn’t until then, on one of the last days of the trip, that it hit me. Israel is doing the exact same thing to Palestine that was done to Israel, to Jews in Europe. It’s perfect family systems. 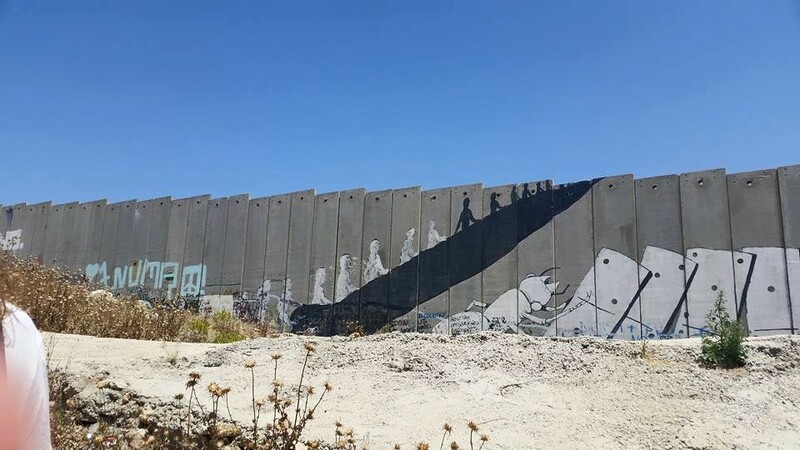 Israel, the young nation, is scared of being treated again like it was in the mid-twentieth century…so Israel is occupying Palestine, illegally, in the same way. 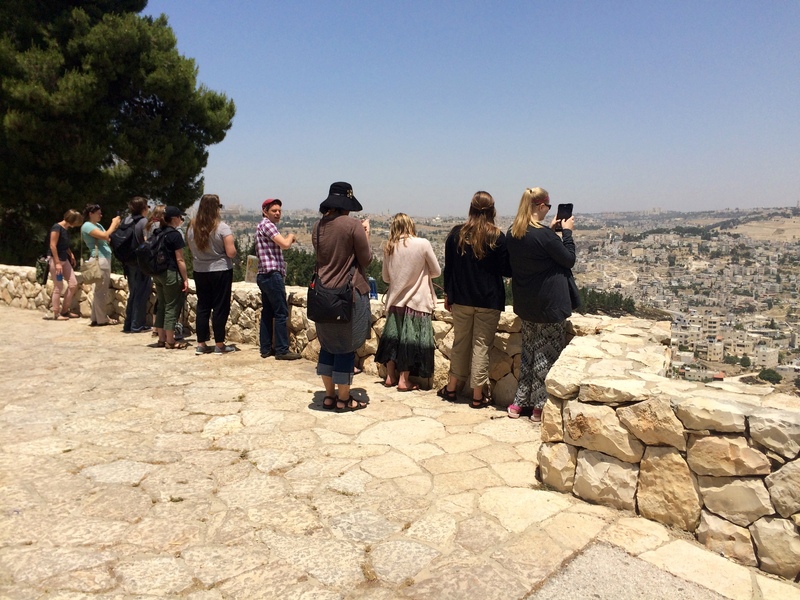 “Museum visitors step out from the traumatic experience to a panoramic view of Jerusalem. The symbolic message that settlement of Jerusalem and Israel is the climactic and victorious end to a history of persecution of Jews is disturbing to those who know what that means to the non-Jewish indigenous population of the land.” The land that this view overlooks was once Palestinian land. Let’s break the system. Let’s talk about how we can talk together about growing together, co-existing together, positively. I don’t mean to be naive here – I confess to not being up-to-date on where we are with the two-state solution, for instance. But let’s continue to name and denounce oppression when we see it and call for peace and non-violence. In this way we make a choice to better and save lives. Thanks to all who have read our reflections on our trips. Looking forward to the future. PS. This is a document which I have yet to read but will very soon, which is a call from Palestinian Christian leaders for us to recognize the situation of the people in Palestine and take action. It was written in 2009 and there was a five year commemoration of it’s writing last year. “Kairos” means, basically, God’s time. I know this document will be a motivating force for me as I continue to think about how I can support peace with justice in Israel and Palestine.